This post is sponsored by 4K Download. Slideshows are the best way to combine all your photos memorize into a single video with amazing effects. You got photos from your school days? Went to a trip and want all photos taken there in one place? Working on someone’s biography and want to narrate on photos? Slideshows are the answer to all those questions. 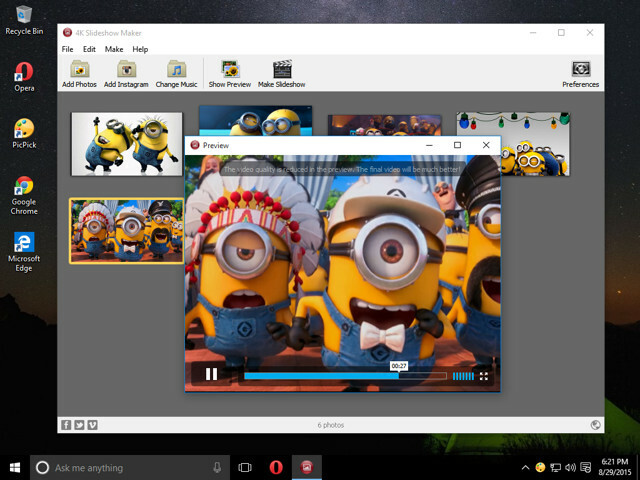 You can easily create slideshows right on your PC, all you need is some pictures (good quality) and a dedicated software. Fortunately, there are many free and paid slideshow maker tools available on the internet to choose from. However, it can be a bit tough to select the best tool according to your need. To help you with your decision, we have reviewed a completely free to use slideshow maker tool called 4K Slideshow Maker. It is a powerful tool and extremely simple to use, one of the main reason why we have reviewed it. 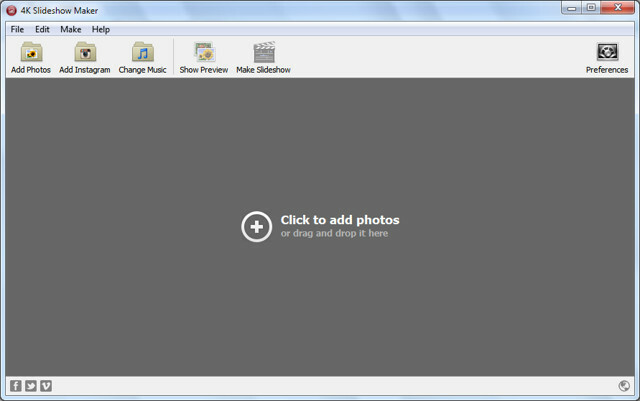 So without further ado, let’s get straight to learning how 4K Slideshow Maker can help us create beautiful slideshows. 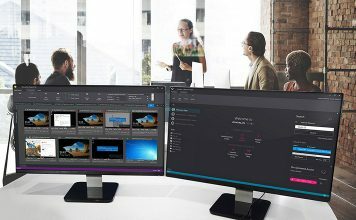 4K Slideshow Maker is created by 4K Download, a software company known for its powerful and completely free to use softwares. As mentioned above, the tool is completely free (no hidden charges) and very simple to use, perfect for beginners. 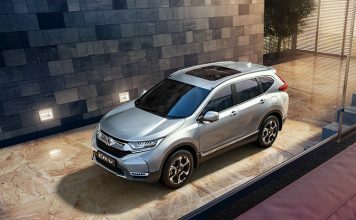 Although, it doesn’t offer much customization options, but its built-in customized options are more than enough for many people. This flaw is also one of its strong points, as it lets the user (especially, a novice) create an amazing slideshow without tinkering with many settings. Furthermore, it is also a very light software (just 31 MB), and comes with a portable version to take it anywhere and use it right from the USB drive. 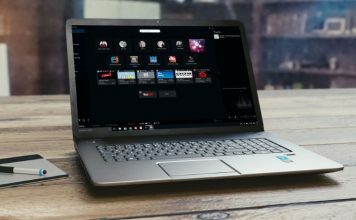 According to the 4K download website, 4K Slideshow Maker works on Windows 8, Windows 7, Windows XP, OSX 10.9, OSX 10.8, OSX 10.7 and Ubuntu Linux. However, we tested the software on Windows 10 as well. The software worked flawlessly with same performance, you can see it in the screenshot below. Just download 4K Slideshow Maker for your choice OS from the main downloads page and install it. The installation is simple and doesn’t contain any kind of adware, toolbars or malware, unlike some other free softwares. When you will launch the program, you will see a very simple interface. To be honest, it might seem a bit offset as well, there aren’t many menus and grayish interface might not seem too attractive to many photo lovers. However, when we digged deep a bit, we understood its real strength. With simple interface containing least menus, this software makes it easy to focus on what is important and get things done with just few clicks. You will see quite a few options there, and all of the processes of 4K Slideshow Maker depend on just these options. We are going to explain each one of them to make it easier for you to understand. You can also just click in the middle of the interface to access this option or drag and drop the pictures from Windows Explorer in the middle of the interface to add them to the program. You can add background music to the slideshow using this option. Just click on it and select the audio file you want to add. This is pretty much it, now the music/audio will be played behind the slideshow. However, this feature will work best for music files, as it can be quite hard to sync a narrated audio file with the slideshow. The tool doesn’t offer any live narration option to add narrated audio to a slideshow. Some of the supported audio formats include, .mp3, .wma, .wav, .ogg, .ape, .flac, .aac and .ac3. 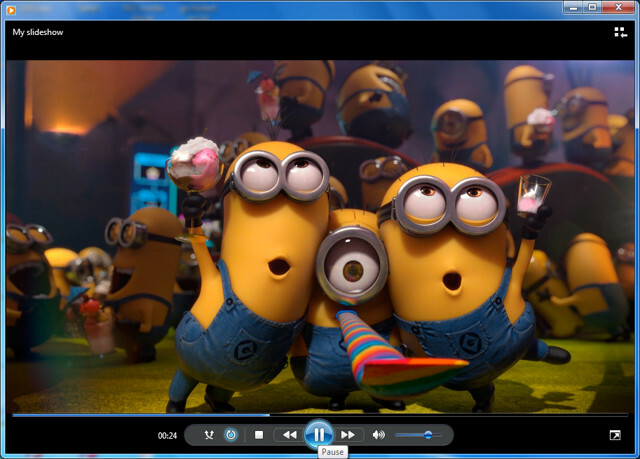 You can use this option to preview the slideshow in 4K Slideshow Maker’s built-in video player. It is quite handy to find out how your masterpiece will look like and make required edits if necessary. Although, don’t trust on the preview when it comes to quality. It is just a quick video of how things look, not how “good” they will look. The picture might be a bit fuzzy here, but when the original slideshow is created, it will be much better. As the name suggests, this option will make the final slideshow depending on your customized options. Although, it is best to customize all the settings (explained in the next heading) before pressing this button, but you will still be provided with options to customize video and output settings. This is the backhand of 4K Slideshow Maker, it contains all the options that you can tweak to customize the slideshow you are about to make. There are many options to tweak, and we are going to explain all of them. Photo Duration: This will let you select the duration the photo will be displayed before changing to the next photo. The unit is in seconds and you can specify as many seconds as you want in the empty text box at the end or use the slider that has maximum limit of 10 seconds. Transition Duration: Transition is the fading effect that occurs when a picture changes. You can use this option to specify transition duration up to 2.5 seconds. But, this tool lacks the ability to change transition styles. 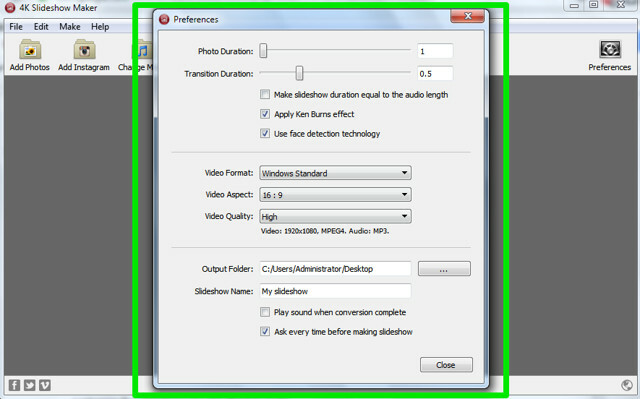 Make Slideshow duration equal to the audio length: This option will auto adjust the “Photo Duration” to the audio file you have added. Apply Ken Burns effect: This will apply the renowned Ken Burns effect to the picture in the video. This make the picture zoom out while moving from right to left or center to back, giving it a little bit 3D effect. Unfortunately, this is the only style you can give to your slideshow with 4K Slideshow Maker. Use face detection technology: This automatically detects the faces in a particular picture. 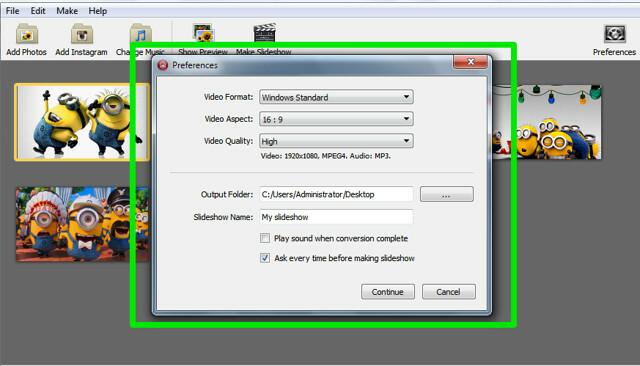 Video Format: You can select the output video format according to the device name, such as Windows, Mac OSX, iPhone and YouTube, etc. Video Aspect: You can change Video aspect ratios (Width and height). You can use 16:9 or 4:3 aspect ratio. 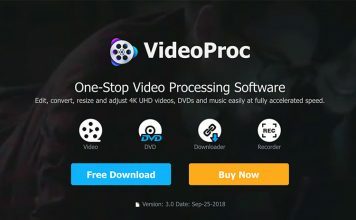 Video Quality: Change quality of the video using Low, Medium and High options. The higher the quality, the bigger the size of the slideshow will be. Output Folder: Choose folder where the slideshows will be saved. Slideshow Name: Give your slideshow a unique name. The default name is “My Slideshow”. Now you can just tweak these settings according to your need to create the perfect slideshow. You can arrange pictures sequence right from the main interface and also rotate any picture you want. Just add pictures, either from your PC or Instagram and create a sequence just by grabbing any of the picture and moving it to the position you want it to be displayed. You can click on the upside down arrow at the bottom-right corner of each picture to show more options. In the options, you can rotate, add and remove the photo. 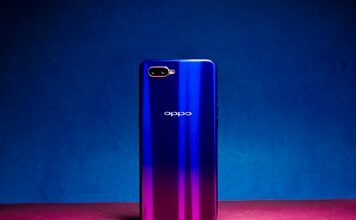 Considering you have already customized all the options explained in the review, click on Make Slideshow and click on “Continue” to start the process. It may take few minutes to create a slideshow and you will be able to see all the pictures while they are being added to the video. For us, it took approximately 13 minutes to create a slideshow. The conditions included, 6 pictures of total 4.4 MB size, Photo Duration 10 seconds, Transition duration 1.5 seconds, all checkboxes checked, Video format: Windows, Video aspect: 16:9 and Video quality: High. The resulted slideshow was of 17.4 MB. With the above example, you can get an estimation of how much time it will take to create your slideshow. 4K Slideshow Maker is a great free and simple to use tool. Although, it lacks many customization options, like effects, styles and audio narration, but it is perfect for some simple high quality slideshows. For average users and specifically beginners, it provides everything, but it might not be able to satisfy some advanced users.